There are numerous health benefits to taking fish oil that have been proven, almost conclusively, through studies, trials and experiments by scientists, doctors and educational facilities. 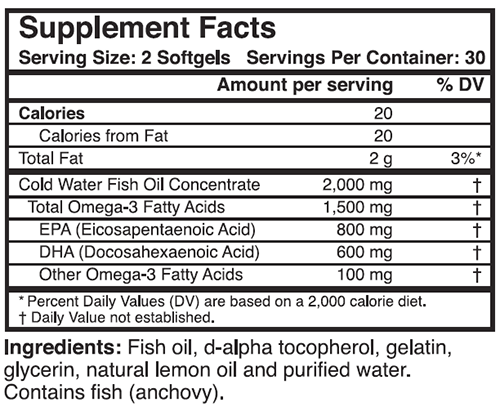 There are three things you must consider when choosing fish oil to supplement your diet. These are the quality of the fish oil itself, the purity of the fish oil, and the Omega-3 content of the fish oil. Fish oils are not all the same. The highest quality fish oil comes from wild caught, cold water fish, and the best cold water fish are found in deep cold waters of the sea. If the label does not state "cold water," it is a low quality warm water fish oil. RHP® Cold Water Fish Oil gel caps are "enteric coated" so that they do not dissolve until they pass through the stomach and reach the intestines. That way there are no "fishy burps" or aftertaste. To ensure you receive the purest fish oil possible, Real Health Products offers fish oil that has been purified through a process called "Molecular Distillation." * Average fish oil has 600 mg (EPA & DHA) Omega-3s. * Higher Quality fish oil has 800 mg (EPA & DHA) Omega-3s. 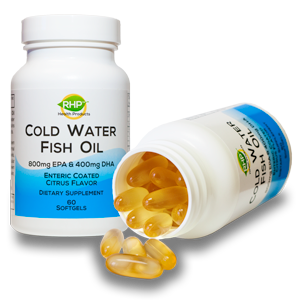 * RHP® Cold Water Fish Oil has 1500 mg (EPA & DHA) Omega-3s. With two to four times the quantity of the primary active ingredients of fish oil, RHP® Cold Water Fish Oil is the most effective fish oil available anywhere. Order the RHP® Cold Water Fish Oil Now! RHP® is a registered trademark of Real Health Products, Inc.